Photograph of tequila bottle and decorative box. Jose Cuervo Reserva de la Familia Tequila 2007 Collection in a box designed by Mexican artist Pedro Friedeberg. 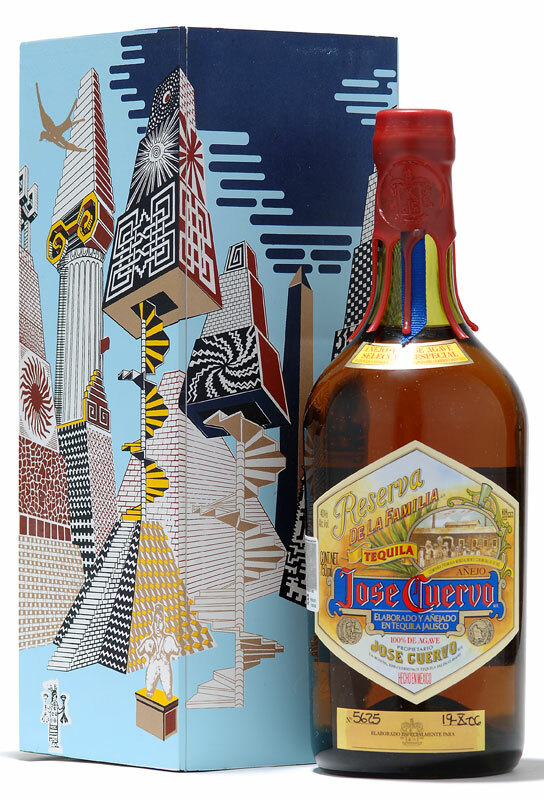 Each year Jose Cuervo uses a different Mexican artist to decorate the box holding the Reserva de la Familia tequila bottle. For this 2007 collection Jose Cuervo presents Pedro Friedeberg. "Creation is a subconscious and mysterious process. My work is extremely melancholic and I believe that all great work must have some sadness of the universal man, who has not been able to discover the mystery of existence." Pedro Friedeberg was born in Florence, Italy in 1936. At the beginning of World War II he came to Mexico where he acquired Mexican citizenship. He studied Architecture at the Universidad Iberoamericana in Mexico City and Fine Arts in Boston and Paris. His painting and sculpture have been exhibited since 1959 in New York, Chicago, Los Angeles, Madrid, Barcelona, Paris, Munich, Hannover, Lisbon, Tel-Aviv, Guadalajara, Mexico City and Monterrey among other cities. Pedro Friedeberg deals with irony. He establishes a discrete gap within memory and knowledge; reconstructs and transforms the reality including elements of Esoterism, Cabala, Tarot and Navigation Codes; Images that share the same space and symetric harmony that follow one another in an incessant vertigo ta the sight of the beholder.